Home / Stock Picks / Hot Stocks / Are These 3 Airline Stocks in for a Smooth Flight or More Turbulence? Statistically speaking, airliner fatalities are incredibly rare. Nevertheless, I can’t help but breathe a sigh of relief that I’m back from my recent European vacation. Recently, airline stocks have endured unwanted attention due to Boeing’s (NYSE:BA) horrific human and PR crisis. On Sunday, Ethiopian Airlines Flight 302 crashed, killing all onboard. The incident comes less than five months after Lion Air Flight 610 also crashed. Immediately, everyone recognized that both incidents involved Boeing’s latest aircraft, the 737 Max 8. But more damning is the possibility that a similar system malfunction doomed both flights. Of course, Boeing stock took the brunt of the damage, and will probably fall even further. The Federal Aviation Administration grounded all U.S.-based 737 Max 8 jets following the lead of many other individual countries and the EU. Over the next few years, oversight agencies will likely examine Boeing’s business and operational practices with the same fervor as a Mueller investigation. But don’t make the mistake the only stock affected by these tragedies is BA. As the 737 Max 8 jets are rapidly becoming a staple among airline stocks, they too have suffered nearer-term volatility. According to a CNBC report, approximately 20% of 737 Max 8 aircraft belong to U.S. airliners. Moreover, the grounding results in a forced opportunity cost and future revenue challenges. With a tech-savvy consumer base, many fliers may eschew the Max 8 for something else even after the planes are cleared for takeoff again. Southwest Airlines (NYSE:LUV) presents a strange case study regarding anticipated reactions versus actual results. According to The New York Times, Southwest owns the largest fleet of Boeing 737 Max 8 jets in the world! Logically, you’d expect the company to lead other airline stocks into the depths of purgatory. So is LUV stock melting down? Shares took some damage following news of the Ethiopian Air disaster, but the volatility has been surprisingly muted. While it nominally owns the now dubious title of Max 8 king, on a percentage basis, Southwest’s exposure is limited. The grounded flights only represent about 4% of its total flights. How then should investors treat LUV stock? Very carefully. Personally, I’d avoid it for right now. Because Southwest largely flies domestically (with relatively short international routes), it’s very sensitive to margins. Therefore, a critical reason exists why Southwest owns so many 737 Max 8 planes: they’re super-efficient on fuel. Now that those planes are grounded and have incurred a reputational smear, I’d wait out LUV stock. From an airline with a lot riding on the Max 8, we now move to American Airlines Group (NASDAQ:AAL). Compared to other airline stocks, American has almost no exposure. Yes, they operate 85 daily flights that utilize the Boeing 737 Max 8. However, they also run 6,700 departures throughout its vast aeronautical empire. Just based on this context, you’d expect AAL stock to suffer the least among domestic airline stocks. Unfortunately, you would be completely wrong. Since the September 21st close of last year, shares have tanked almost 27%. Plus, the typical enthusiasm following the new year hasn’t done anything for the airliner. If you follow what the market is telling you, the approach explains itself: stay far away from AAL stock. And this is exactly the guidance I provided for conservative investors on Monday. However, those who want to live dangerously have a speculative case. Because AAL stock has dropped much more than other airline stocks, it’s likely to drive higher on any positive news. Just be sure you know where the exits are. 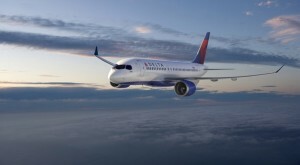 I have a love-hate relationship with Delta Air Lines (NYSE:DAL). On the U.S.-side, their customer service is terrible. Strangely, though, they know how to treat their customers right. And their long-haul 767s don’t feature the dreaded 3-4-3 seating configuration. Traveling to Europe, though, you’re going to hate life for the next several hours. That’s because Delta partners with European airliners, and they go with the opposite philosophy: exemplary service in an inhumane environment. As I was flying somewhere over the Atlantic Ocean, a thought crossed my mind. Delta does this because they know they can get away with it. Indeed, the profit margins supporting DAL stock are significantly higher compared to most airline stocks. While Southwest beats Delta in this department, I think their leverage towards the 737 Max 8 will rear its ugly head. At this juncture, I don’t really care for airliners. However, if I had to choose, I’d reluctantly go with DAL stock. They have the lucrative flights and the cutthroat mentality to thrive in this sector. Just don’t expect me to like them because I don’t. Article printed from InvestorPlace Media, https://investorplace.com/2019/03/buy-sell-trade-these-3-airline-stocks-luv-aal-dal/.